AMD launched a trio of new APUs just recently. Codenamed Kaveri and using an updated CPU architecture (Steamroller) alongside GCN graphics present in discrete Radeons, the premium mainstream A8 and A10 chips offer solid performance in most applications. But there have been physical changes in the move between last-generation Richland and Kaveri APUs. The new processors have two extra pins over their APU brethren, meaning that a new motherboard socket, FM2+, is required. AMD's partners have already launched such supporting boards based on the revised A88X, A75 and select A55 chipsets. Leading the motherboard charge is ASRock, who has no fewer than 20 FM2+ boards in its arsenal. Available with varying feature sets and form factors, Kaveri, especially the power-efficient A8-7600, is ideally suited to being paired with a Mini ITX board. 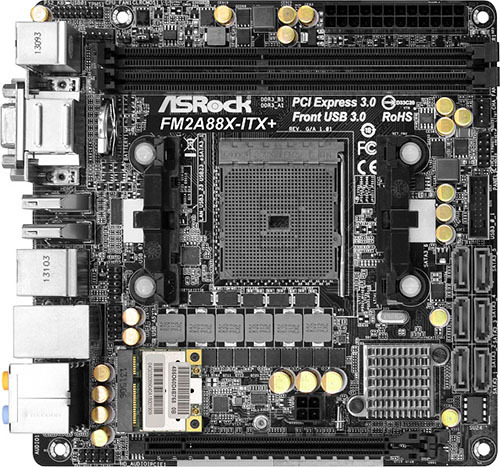 ASRock has that base covered with a couple of boards headlined by the FM2A88X-ITX+. Building a Mini ITX board brings its own special challenges when the CPU socket and exclusion area is so large. ASRock moves it down to the middle section and locates the 4-pin CPU connector in an awkward spot just below. Though tiny in footprint, there's the full gamut of six SATA6Gbps ports, a front header for USB 3.0, two DIMM slots and a full-length PCIe 3.0 x16 interface that supports Dual Graphics when a compatible Radeon R7/R5 card is used. Being critical, the DIMM slots feel a little too close together for comfort - the modules are very tightly packed - and spatial restrictions do come into play when using aftermarket coolers that bolt through to the rear; the board has a number of components that can interfere with the mounting brackets used by heatsinks such as the Cooler Master Hyper 212 Evo. ASRock understands this board is likely to be used as a base for a mainstream PC that's geared towards multimedia usage - the APUs are good in that regard. We like that the mini-PCIe slot is pre-populated with a combo 802.11n and Bluetooth 4.0 card, with antennas supplied in the package. The slot can also be used to house an mSATA drive, should you so wish. Due to the size of the board there are only two fan headers present - one CPU and one for a system fan - but that's adequate for a small, quiet build. There are no fancy enthusiast offerings such as debug LED, dual BIOSes, or onboard buttons, but at £75, value is of more importance than features. Where ASRock scores big is in the IO panel. Well-stocked by offering dual-link DVI, VGA and both HDMI input and outputs, the A88X-ITX+ also has an eSATA port, Gigabit Ethernet, audio by way of ALC1150 Codec, optical S/DPIF-out and four USB 2.0. Another couple of USB 3.0s are also available and they come directly from the A88X chipset. Perhaps the most unusual feature here is HDMI-In. Connecting up an external device - iPad, for example - lets the user output video to the computer monitor and toggle back to the desktop screen via a keyboard hotkey. This HDMI passthrough also works when the PC is powered off. 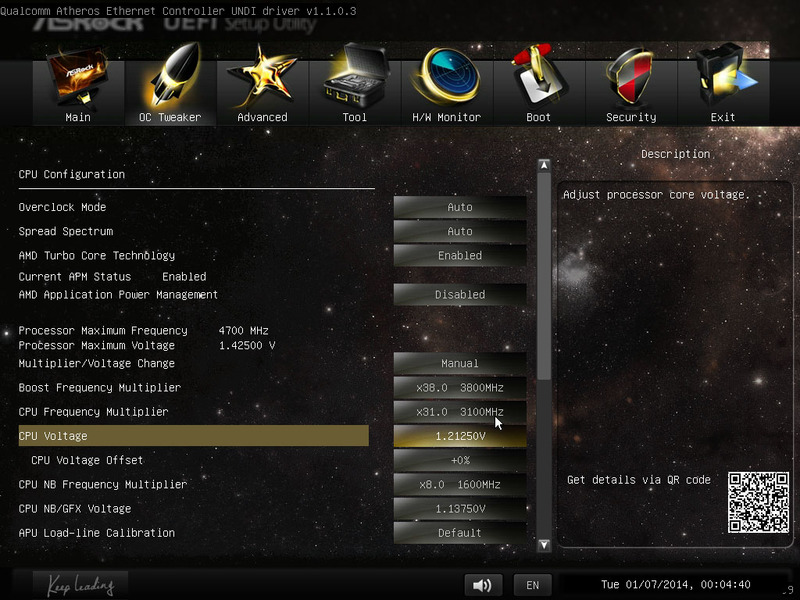 ASRock's thought hard about how to make a Mini ITX useful for today's mainstream PCs. The A88X-ITX+ has no obvious weaknesses at the £75 price point, and paired with an energy-efficient A8-7600 makes a good case for an inexpensive build. 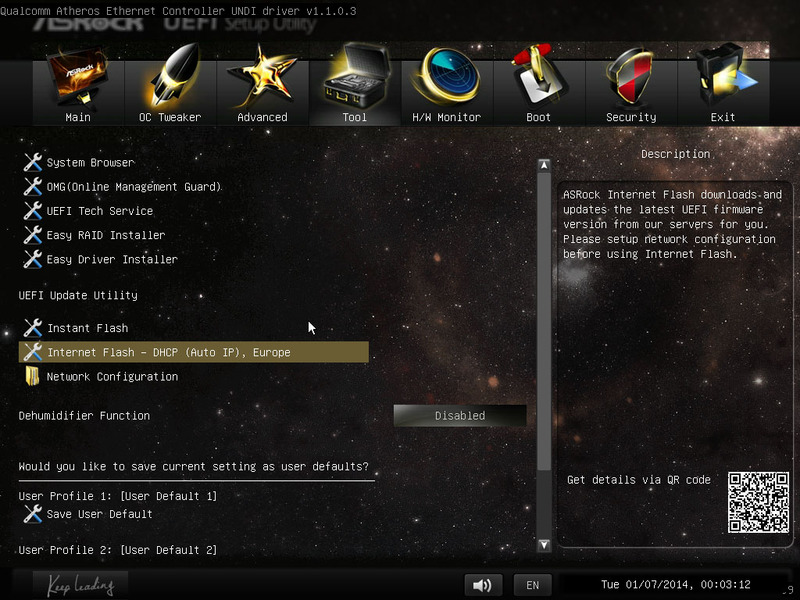 The BIOS does a good job catering for those with a predilection for tinkering. There's ample voltage and frequency selections available, including 2,400MHz on the memory and an improbable 6,300MHz for the CPU. The fan-speed section, meanwhile, is rather basic, with the choice of setting the two fans to one of three basic modes. 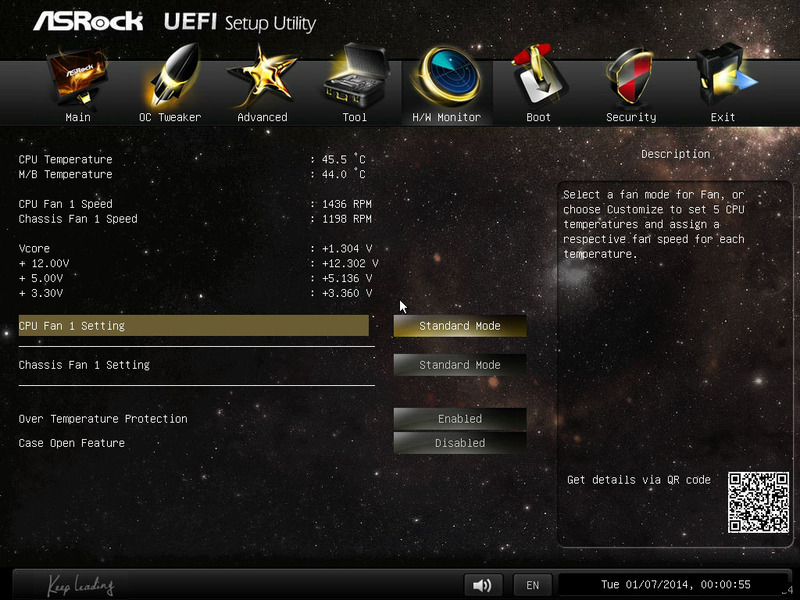 ASRock has a long list of features that are inherent on almost every motherboard, and one that we particularly like is the ability to update the BIOS via a web server with the network cable hooked up to the LAN port - it took around a minute to update the board to, at the time, the latest 1.9.0 BIOS.